This isn’t a partisan issue. We conducted an informal survey (read: Google search) of races in every district of the U.S. and discovered universal consensus. It did not matter whether the office-seeker was Republican, Democrat, Socialist, John Birch, Green Party, Tea Party, Libertarian or Peace & Freedom Party–we could find no one stumping for an increase in prices for our most essential services and goods. And therein lies the root of our problem. Because our country’s ‘choke points’ reported thus far portend such massive national security risks, readers may have assumed such are the result of bad policies, obsolete technologies, or distracted officials at the top. If true, the disease offers obvious quick fixes. The reality runs deeper and more disturbing. Natural resource depletion comes at the behest of our free, rational and informed electorate. We confront threats not from some corrupt regulator, incompetent bureaucrat or nefarious multinational corporation, but from the enemy in the mirror: ourselves. Yes, when it comes to water and energy, our democratic system is working all too well. To grasp this paradox, recall Monopoly. Yes, the board game. Of all the pretty colored properties a player could land on, from Mediterranean Avenue to Boardwalk, two bland squares sat relatively worthless: “Electric Company” and “Water Works.” You couldn’t invest in these assets with houses and hotels, and rent was cheap. Too cheap. 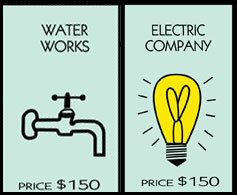 In reality, undervalued utilities are our only remaining, centrally organized, all-encompassing, absolute monopolies. They control every aspect of our lives. What’s more, the two are inextricably linked. In the U.S., a fifth of all energy may be consumed by water, and the biggest use of water – 42% by some estimates – is for energy. We might well consider the two utilities as one combined, vertically integrated ‘watergy’ monopoly. Of course, watergy’s monopoly is natural; there’s nothing unfair or illegal about it. We can’t have dozens of competing wires or pipes extending from a single hydropower dam, river and reservoir. So, to control the monopoly’s risks, we enact oversight laws, establish public service commissions, and elect honest men and women to represent our civic interests. These officials work carefully and tirelessly to prevent watergy monopolies from exploiting end users, especially the poorest among us, with exorbitant rates. The bottom line is that we enjoy a watergy supply that is, in effect, rent-controlled. However, this delightful economic outcome grows perverse when coupled with our political system. The guy who decides what we pay for watergy? He works for us. As watergy flows decline and provision costs rise, utilities could – and in theory should – raise rates to balance out demand and supply. In practice, we voters ensure that they don’t. We only elect officials who keep rates – for residential, commercial, industrial and agricultural use – artificially low. It is hard to call them ‘cowards’ for declining to commit political suicide. A visual representation of the water-energy nexus. Click through the graphic for more information. As a result, utilities muddle along, forced to make up cash shortfalls caused by low per-unit rates by selling a higher volume of our liquid assets. So cheap rates encourage us to waste both water-embedded energy and energy-embedded water. In the rare emergency situations during which a utility does increase rates to cover costs, a brief rate spike can trigger a vicious ‘death spiral’ which causes frugal consumers to use less watergy, which – as our basic economic training tells us – must then be offset by even higher rates, leading to even less use, causing higher rates etc. Thus, one alternative to choking is starving. Or mandatory gastric bypass. The dark irony is that authoritarian regimes may do a better job of imposing a diet of forced conservation than free societies. Likewise, the most effective watergy-saving campaigns in the U.S. are also the most heavy- handed, involving rations, restrictions, police, surveillance, fines, and hotlines through which ‘good citizens’ are urged to snitch on ‘bad neighbors’ private habits. Our analysis of choke points may seem bleak, even fatalistic. Must democratically governed utilities keep wasting watergy at our behest? Does watergy conservation require erosion of economic freedom and individual liberty? Next, allocate equal quantities of these online metered assets – say five EcoShares per day — to every residential, commercial and industrial account. Then let recipients trade whatever surplus they produce or choose not to consume to those who want more (“save and trade”). In this scenario, there is no need to ‘correct’ human nature, but instead we leverage our innate greed or envy to address our watergy crisis. Any individual who consumed less than his/her share, could sell unused shares to others who wanted more, whether they be thirsty neighbors with a green lawn in the desert; water-intensive businesses; innovative conservation groups who wanted to “retire” them or return them to the watershed; or to the utility itself, all for a cash profit. In an election year, such an approach offers benefits across the political spectrum. Conservatives know that ‘owning’ virtual shares in watergy would unlock and engage the creative energies of a majority of private individuals working in their own long-term self-interest. Liberals could embrace their democratic impulse to give every American an equal-opportunity starting point each day and seize upon this approach’s ability to avoid punishing the poor or policing our neighbors over watergy use. Libertarians can rejoice that–instead of new laws, policies, taxes or police pushing reforms from the top down–an online community exchange platform would encourage a competitive yet voluntary culture of conspicuous conservation. In sum, watergy depletion is hardly reserved for technocratic elites. To the contrary, the problem and the solution, belong entirely to you and me. And, in our do-it-ourselves watergy world, it helps to remember the Heimlich maneuver. The first lesson is not reaching down in to forcibly dislodge the source of the choke point from above. Instead, seek out natural reserves, work with–rather than against–the flow, and use our own hands to lift up from below. Simus is the co-founder and chief executive of SmartMarkets LLC; Workman is the author of Heart of Dryness: How the Last Bushmen Can Help Us Endure the Coming Age of Permanent Drought. Read excerpts from Workman’s book on Circle of Blue. Graphic by Kelly Shea, a Ball State University undergraduate student, with contribution from Aubrey Ann Parker and Molly Walton. Reach them at circleofblue.org/contact. Brilliant! Yes, voters need to see an advantage to water conservation, and a few bucks in their pocket is far more “informational” than a few gallons or kWh less than ??? I’m a UK citizen + am saying to explain that I don’t know US politics, water/energy economics etc. so well apart from what I’ve read here. My feeling is from reading this piece once, is that while the analysis of zero incentives for conservation due to the political cycle is insightful, anything that smacks of resource allocation or rationing in the US is politically unacceptable as healthcare reform showed. In the UK, more people might like this idea, but it would still never be implemented as consumers in practice don’t want to reduce their real income. In the US, there would be the additional problem that resource rationing would be an absolute political taboo and ideologically unacceptable. Imagine how much fun the right wing and talk radio would have with the Bushmen analogy if it ever get anywhere near policy-making. The equality of distribution between business, household and industrial units is also a major gap in the presentation as any such allocation would no doubt be challenged for being extremely arbitrary, even if it was a good way in theory to arrive at long-term welfare-maximizing watergy pricing. There is no point trying to introduce a micro-economic mechanism for water and energy use reduction if it is politically impossible. What is needed is much richer communication about the problems the US faces with water and energy, in ways that step far outside the pleasant Blue state intellectual bubble. This means real leadership and understanding of the American national mood as we enter a decade where resource scarcity could at last become a major macroeconomic risk factor. On 22 September 2010 you state the “The US consumes about 100 billion gallons of water a day. Nearly 85% is used for crop and livestock production. Of the 16.1 billion gallons that remain, half is devoted to producing energy.” This conflicts with the 42% you propose here. Big difference. Wondering, which is correct?